I am very pleased to introduce to you the newest member of our family. 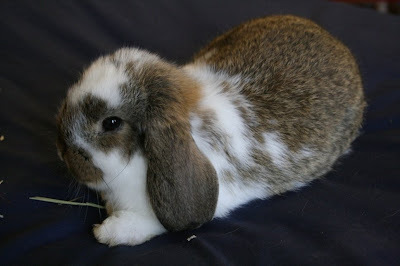 Her name is Thistle and she is a Holland Lop bunny. She was born on Groundhog Day. She left her mother and brothers and sisters two days ago to come and live with us. She will provide great companionship for our other house rabbit, Burdock Bunny, who will be two years old in May. Rabbits make terrific pets. I have been keeping a pet rabbit for ten years now. I am convinced that people who have a pet are healthier and happier for it. Rabbits are easy to look after, inexpensive to keep and will give you total unconditional love. One of the best sources of information about keeping a bunny as a pet is the House Rabbit Society website.